During the past couple months the world has watched as the political situation in Albania -- not normally a grabber of international headlines -- has slipped into anarchy because of failed government-sponsored investment schemes. Many Albanians believed President Sali Berisha was behind the failed schemes and demanded that he be removed from office immediately. 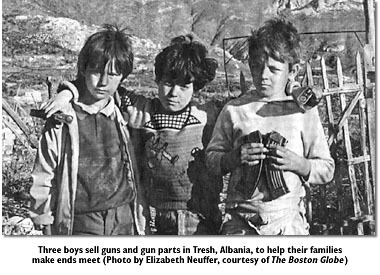 Some Albanians took things a step further: after looting army ammunition depots, Albanian rebels used their booty -- mainly AK-47s and surface-to-air missile launchers -- to wreak havoc throughout the impoverished countryside. A deployment of 6,000 soldiers, from eight European countries and under Italian command, has now arrived in Albania. "It is an indispensable mission," said Italian President Oscar Luigi Scalfaro of the recent deployment. "Albania is simply falling apart." Self-isolating, destitute, fiercely independent, Albania is almost as enigmatic today is it was under Enver Hoxha, the xenophobic communist dictator who ruled Albania for forty years after the Second World War. Over the years The Atlantic has sought to shed light on this often neglected Balkan nation, through a variety of articles that have ranged from acute historical and political analyses to intrepid travelogues penned at a time -- the 1960s -- when Albania was virtually impossible to penetrate. Robert D. Kaplan, in "Europe's Third World" (July, 1989) -- which would later be expanded into his critically acclaimed Balkan Ghosts (1993) -- depicted the ethnic strife between the Albanians and Serbs living in the southern Serbian province of Kosovo. The conflict between the Serbs and Albanians, according to Kaplan, has "its roots in the Battle of Kosovo Polje, in 1389, when the Serbian hero Lazar lost his kingdom to the Ottoman Turks, a circumstance that would eventually encourage the settlement of large numbers of Albanians in what had been Orthodox Christian territory." In "The Spark That May Cause a Fire" (February, 1985), Roberto Ducci predicted an eventual Soviet invasion of Albania and went so far as to lay down a specific scenario as to how it might actually come about. Although Ducci's prediction was never realized, he made clear Albania's strategic and geographical importance in the Mediterranean. Ducci wrote, "The re-establishment of Soviet influence in Albania would enable Moscow to exert pressure on Yugoslavia by encouraging Albanian irredentism toward Kosovo and umpiring the two parties' claims. The long-coveted Albanian ports might be opened to the Soviet Mediterranean fleet. Furthermore, the annexation of Albania would allow Soviet forces to establish electronic surveillance over much of the Mediterranean region." We were taken to see what was termed a typical lakeside village. The poor guide could not have foreseen that on this particular day about twenty people, some old peasant women, a few naked children, and regrettably, a handful of able-bodied men, would be lying down and dozing in the main road. He went over to them and furiously told them to get to their feet, since they evidently represented the new Albania, and Lavdi Marksizm Leninizmit ("Glory to Marxism and Leninism"), and the rest of it. We were able to photograph this patriotic operation. In "Albania: The Last Marxist Paradise" (June, 1963), James Cameron offered an account of entering untouched journalistic terrain and made frank observations on various facets of Albanian culture. Half the people wore the drab serge of a normal urban proletariat, but the other half, without any kind of self-consciousness at all, swaggered around in the white Macedonian tarboosh, the embroidered xhublete, and the enormous baggy pantaloons of the Muslim highlander. Albania must be one of the few countries left where what is known as peasant costume is in fact worn by peasants. I went in and asked the neat little waitress for an ouzo, not because I particularly dote on Albanian ouzo (which, unlike the Greek kind, turns with water into a threatening shade of green) but because I found it the least ambiguous thing to order. Then there was the reaction to which I had become accustomed: every eye in the room swiveled simultaneously to fasten on me for one long reflective stare; then swiveled back and never returned. It is very hard to define its nature, other than to say that it was Balkan food taken to its final and desperate conclusion: pasta that had been cooked, or apparently so, many days before, then passed through some compressing process; vague and improbable cuts of antique meat subjected to brief and inadequate heat; hollow tomatoes filled with a kind of herbal sawdust. Discuss this feature in the Global Views forum of Post & Riposte.